Writing from Home: A Portfolio of Homeschooled Student Writing by Susan Richman, 372pp. $8.95 (paperback). Inspire your children to write by reading them other children's writing. Find out how that writing came about. The 372 page book is full of a variety of types of writing -- observations of the world, family life stories, poetry, book responses, field trip followups, family newspapers, fiction and more. There are also many ideas for parents in the intro sections to each chapter, coving topics such as motivating children to write, establishing an encouraging environment, finding real audiences, starting writing clubs, setting up family newspapers, and much more -- and you won't have to do the mental translating necessary when reading books on writing directed at teachers in schools. It is truly a book for the whole family, the first of its kind, and should be in the "tool kit" of every homeschooling family! The book is more than simply a collection of the young people's finished writing... Susan Richman has had the opportunity to learn about how these children write. She has heard the stories behind the finished work that was submitted and has included many of these stories here.... The book is more than a proud display of accomplishment (although of course it is that too). It is a way for us to begin to understand what makes accomplishment possible. I wanted to tell you how much I've enjoyed using Writing from Home this year. It has made an easy quick reference for examples when I've wanted my children to do a certain type of writing. Thanks for the work I know you put into writing and organizing the book. I am in the middle of reading your book, Writing from Home and enjoying every page! My daughters and I have read several stories together, but I'm not finished! It is so refreshing to read such writing from children. I have worked as a volunteer in the public school system for seven years. In that time I can't remember seeing the quality and variety of subjects that appear in this book. Thank you for making this available to the public. 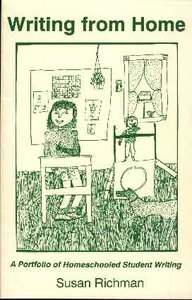 This book is much more than "a portfolio of homeschooled student writing," as its subtitle modestly implies. True, editor Susan Richman first got the idea for the book from the student portfolios she was evaluating (Pennsylvania law requires such portfolios). But, being the unique lady she is, she had the additional idea of including the children's and parents' thoughts about the children's writing right along with the writing itself. This book has not only hundreds of inspirational examples of student writing (inspirational in the sense that your child will be inspired, not overawed, by what other children his age have accomplished) but dozens of ideas for helping our children improve their writing. I am hardly every attempted to say a book has everything, but this one comes mighty close. From a whole chapter on how to create a productive writing environment, to the final index of books on writing and major writing contests your children can enter. I don't see how anyone can read Writing from Home and not be surprised and excited about the possibilities captured between the covers of this book. Kids will feel the same way. Thanks to the book's non-patronizing tone, they can read it right along with you!